Surrounded by two streams of River Cauvery, Srirangapatna, an egg shaped island, is situated in the district of Mandya and spreads over an area of 13 Sq. Km. Location of this city makes a trip to this place a worthy one. This town is well known for its religious, historical and cultural significance. According to historians, it is believed that Lord Buddha remained on an island that lies in the vicinity of Srirangapatna. This town was named after the well known Ranganathaswamy temple. Constructed in the 9th century, this temple was built during the reigning period of Ganga dynasty. 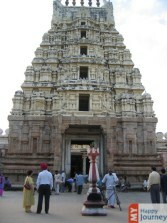 This temple is considered as a perfect example of Vijayanagar and Hoysala style of Architecture. The presence of river Cauvery is considered auspicious and it is here that people from all over the country come to submerge the ashes of departed souls and to mark obeisance to their ancestors. Main attraction of the region remains a fort that was built in 1537 by a feudal lord. The four main entrances as well as the dual wall defense arrangement give a glimpse of the Indo-Islamic style of architecture. Inscriptions in Persian language present on the gateway of the fort tell about the date of construction of the fort. Various scenic spots, such as the Shivanassamudra Falls, make it a sight worth seeing. The astounding beauty of the place is sure to leave its visitors wanting more. Therefore to enjoy in the serene and panoramic ambiance, pack your bags and head towards this beautiful island which lies close to the city of Mysore.